Dry sandy forests and banks. White rays seem the only sure character for distinguishing this species from S. hispida. Unfortunately, the color cannot be safely determined from long-dried specimens. We have mapped as S. bicolor only specimens for which the collector in publications or available field notes, if not on the labels, stated the color to be white or indicated that color by distinguishing between S. bicolor var. bicolor and S. bicolor var. concolor (= S. hispida). MICHIGAN FLORA ONLINE. A. A. Reznicek, E. G. Voss, & B. S. Walters. February 2011. University of Michigan. Web. 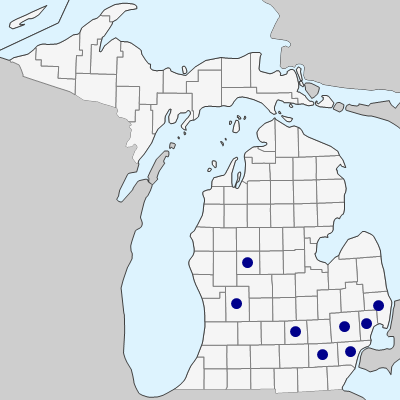 April 21, 2019. https://michiganflora.net/species.aspx?id=452.